William Avery Bishop is recognized as the British Empire’s highest-scoring WWI ace, credited with 72 combat victories, third-ranking behind von Richthofen and René Fonck. He scored many of his successes on his own, prevailing only by dint of personal courage, daring and superior marksmanship. This remarkable man’s story has been detailed in many books and articles, but renowned author Peter Kilduff is adamant that so far the full truth has not been told. Famed for his evenhanded, thorough, exhaustive and forensic research, Kilduff sets out to bring new light to missions and kills so far steeped in controversy. As so many of Bishop’s victories were achieved during solo combat, all will be examined and scrutinized, drawing on German, British and Canadian archival sources, Bishop’s private correspondence, and accounts by friends and foes. Such an approach provides as complete an account as possible which also serves as a valuable reference work containing many previously unpublished images. Peter Kilduff has been studying and researching aviation history for over fifty years. He was a journalist and professional communicator for over forty years, and retired as Director of University Relations at his Alma Mater Central Connecticut State University. "eter Kilduff has done a superb job in slicing through the fog and controversy of nearly a century to produce a readable, objective account of Billy Bishop—the lone hunter"
"This solidly constructed book by Peter Kilduff analyses the career of Canada’s greatest ace. The author combines his work pouring over British and German records in addition to the many letters our hero wrote to his beloved wife and family....Peter Kilduff has done a very good job here... excellent photographs. Grub Street do these aviation histories very well and here’s hoping they continue." "Any fair-minded reader will set Kilduff’s book down convinced that Billy Bishop was a genuine hero. All in all, he has produced an excellent work." "Comparing letters Billy wrote to his then fiancée Margaret to records of downed German aircraft, Kilduff found the dates and descriptions of Billy’s conquests matched German reports time after time, indicating Billy really was as good as his reputation. Kilduff found documented evidence the Germans knew who Billy was and they respected him for his talent and skills even as they feared him. “I just kept digging, digging and digging. I found proof of Billy’s victories. Billy’s combat reports were sparse, but honest. He shot down 72 German planes. More than any other allied target,” said Kilduff. There were challenges when researching Billy Bishop. Not all German causalities were reported. He had to study the reporting policy on either side of the water. The author discovered the Germans didn’t want to admit they were defeated very early on in the war, so they minimized their casualty numbers for over two years to maintain the support of German citizens." "Kildufff's latest biography considers the facts and leaves prejudices and jingoism out of the discussion. The latter is refreshing and makes this book a most valuable contribution to the arguments." "…Kilduff is not the first to conduct such an inquiry into Bishop's claim of 72 victories, but his book is by far the best researched…expertly laid out, with photos of the aircraft mentioned by Bishop, particularly the German types. Kilduff has done a marvelous and subtle job of showing how a real hero became larger than life. "This is an indispensable work for anyone seeking to understand Billy Bishop’s story. It will not be surpassed for a long time to come." 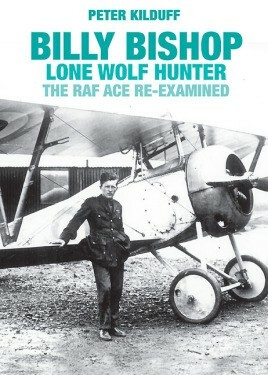 ".... easy to read and is extensively illustrated... gives an excellent account of Billy Bishop as an RFC pilot learning to fly in France in 1916 and his subsequent successful air fighting in 1917 and 1918...discusses and presents the known facts about Billy Bishop’s claim that he was the victor in seventy-two aerial fights. It is highly recommended for use as a reference book by air historians but would also appeal to anyone interested in air fighting on the Western Front in the last three years of the Great War." "...carefully researched biography of Billy Bishops sheds light on many questions surrounding Canada's most famous WWI hero...an indispensable work for anyone seeking to understand Billy Bishop's story. It will not be surpassed for a long time to come"